I must say, I was pretty excited to be able to make this cake! 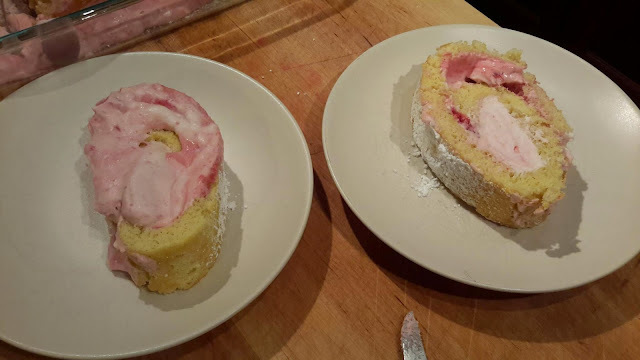 I have never made a rolled cake before but I can now say that I have the experience. The cake was quite labor-intensive if you were to look at all the steps needed. 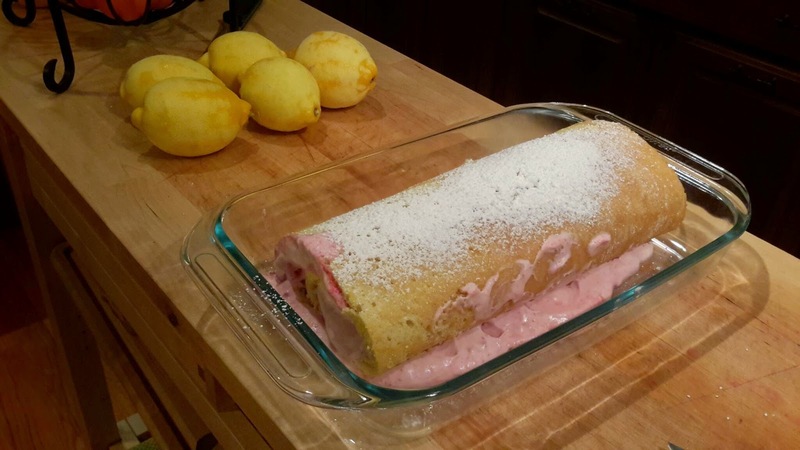 Both a food processor and the mixer were needed for this one, 5 lemons needed to be zested, the raspberries had to be blended in the food processor and then push through a fine mesh sieve. It does not look nearly as good as the picture in the book but that doesn't affect the taste too much, fortunately. The lemon cake wasn't all that exciting. Even with the 5 zested lemons and the lemon extract it was kind of lacking flavor. There is nothing great that stood out about it. The whipped cream on the other hand- it is hard to go wrong with whipped cream! So overall the presentation of the cake is pretty neat and it tastes ok. With the added raspberries and lemon it tastes like its a lot healthier for you than the 1 cup of sugar end 8 tablespoons of confectioners sugar would lead you to believe.